The first game between the LA Galaxy and Los Angeles FC was already billed to be a media draw but the game itself ended up being the talk of the MLS once all was said and done. Major League Soccer never ceases creating headlines and in Week 5, teams from across North America did exactly that. The LA Galaxy and Los Angeles FC produced a multi-goal thriller on one coast while Orlando City SC and the New York Red Bulls produced another multi-goal thriller on their coast. Let's get this out of the way quickly; the defending from both teams was appalling throughout 'El Tráfico' but what it resulted in, was a game for the ages. The derby started off with a bang as Carlos Vela curled a sumptuous effort into the top left-hand corner from just outside the box in the fifth minute. LAFC were not done yet and neither was Vela as he grabbed his second of the day in the 26th minute. The Mexican kept his composure to leave Galaxy goalkeeper David Bingham stranded and then finishing past five Galaxy defenders all lined up at the goal line. LAFC must have thought the game was done and dusted in the 48th minute when Daniel Steres knocked the ball into his own net after trying to keep out Marco Ureña's effort but it was not to be for the visitors. Their midfield fell asleep in the 61st minute and allowed Servando Carrasco to strip the ball away in the attacking third before feeding the ball to Sebastian Lletget, who finished well past Tyler Miller. Chris Pontius then made it two with a firm header from Ashley Cole's cross in the 73rd minute and it was game on. Enter Zlatan Ibrahimović. 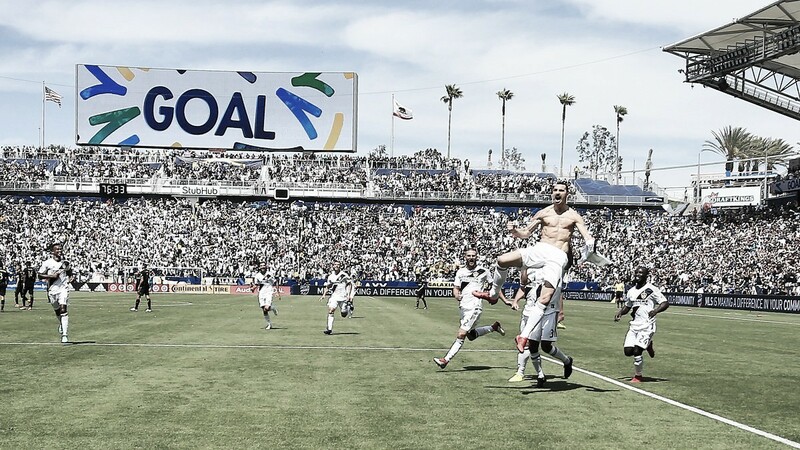 Much has been made about Ibrahimović's arrival to the MLS and the Swede lived up to the hype and more in this game. He scored the equalizer for the Galaxy in the 77th minute with an audacious 40 plus yard volley over Miller's scrambling form and Ibrahimović bagged the winner in stoppage time, beating his marker to Cole's cross into the box. A lot will be said about Ibrahimović's influence in this game and rightly so but Bob Bradley will be livid at how easily his team capitulated and allowed the Galaxy back into the game after being 3-0 up. If LAFC had kept their composure, not even Ibrahimović would have been able to dig the Galaxy out of the hole they were in. Fortunately for the home side, LAFC lost their focus and they never gave up, setting up the perfect platform for Ibrahimović debut magic and their second win of the season. 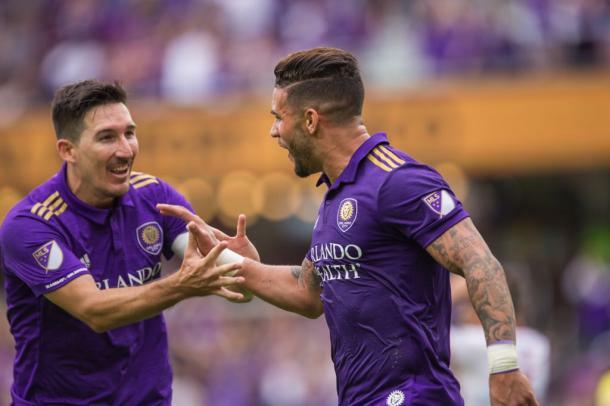 On the east coast, MLS fans were treated to another fantastic seven goal game when Orlando City SC squared off against the New York Red Bulls. Orlando did not start the game well as they gave up an early goal to the Red Bulls. Florian Valot struck in the seventh minute with a powerful header after Alejandro Gamarra had picked out the Frenchman at the far post. Orlando responded well and found the equalizer in the 15th minute when Justin Meram squared the ball to an unmarked Will Johnson who had an easy tap in from six yards out. The see-saw nature of the first half continued on as Derrick Etienne Jr put the Red Bulls back on top in the 24th minute after being played through on goal. Orlando came back again two minutes later when Dom Dwyer popped up at the near post to nod the ball home from a corner kick. Dwyer got his brace in the 48th minute with a one time finish that went low past the goalkeeper's dive and into the far corner of the game. Orlando could not hang on to the lead however and Aaron Long got on the end of a set piece from Marc Rzatkowski in the 82nd minute to put the Red Bulls back on level terms. It took some late game heroics from the home side to get the win and even then, the nature of the goal was fortunate. Scott Sutter took a speculative effort on goal from outside the box in the 88th minute which bounced off of Josue Colman and into the goal, wrong-footing Luis Robles. The healthier Orlando get, the better they will be and this match was a showcase of that as the hosts got their first win of the season. Dwyer, who is fresh off an injury and made his season debut for Orlando against the Red Bulls, brought some much-needed sharpness in front of goal and remained a threat throughout the game. The Red Bulls will be unhappy with the defensive effort they put forth and will want to change things so that their CONCACAF Champions League aspirations do not continue to give them such inconsistent form the MLS. The Colorado Rapids hosted the Philadelphia Union on Saturday night and came away with their first win of the season. The Rapids almost took the lead in the 44th minute of the game but a big stop from a point blank header by Andre Blake and a good defensive block seconds afterwards kept Philadelphia in the game. Blake was powerless in the 53rd minute when Dominique Badji came n at the far post on another Rapids' corner kick and powered the ball home from close range. Badji was on hand to score the second in the 61st minute when Johan Blomberg​'s effort came off a Union defender, wrong-footing Blake and allowing Badji to score into an open net. 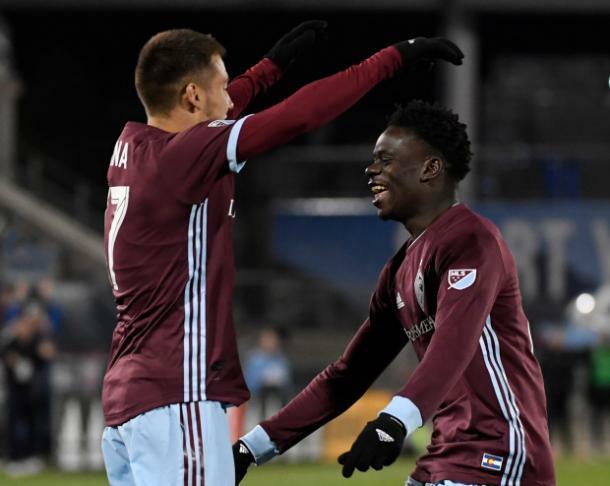 Blomberg was again the provider in the 87th minute when his cross field ball found Badji who raced away from his marker before finishing low past Blake, completing his hat-trick and guaranteeing the win for the Rapids. Last time out, Colorado allowed their opponents to claw their way back into the game after the Rapids had taken the lead. That wasn't the case this time against Philadelphia as the Rapids closed out the game and scored a third as extra insurance for their win. The Union will be worried with how easily they were dismantled by the Rapids after being so miserly in defense before this weekend. Philadelphia will want to address that during this week before their next game. Vancouver Whitecaps FC pulled off a great win against a very strong Columbus Crew SC side thanks to a late Kei Kamara goal. Gyasi Zardes, who's in good form at the moment, gave the hosts the lead in the 29th minute when he pounced quickly on Stefan Marinovic's spill and finished into an empty net. Vancouver found their way back into the match in the second half picked up the goals to show for it. The other goalkeeper in the game, Zack Steffen, didn't cover himself in much glory either as his mishandled catch in the 51st minute allowed Brek Shea to smash home the equalizer for Vancouver. Kamara then finished things off on his return to Columbus as he nodded home a cross from Felipe​ in the 78th minute. Columbus almost got a share of the points late in the game but Arturo could not keep his header on target and it came off the post and away from goal. Vancouver continue to quietly gather points and the win this weekend leaves them joint top of the Western conference table with Sporting Kansas City. Columbus will be disappointed to lose at home, a venue they're usually almost unstoppabble at. They will look towards their next game to rectify this and keep their good start to the season going. Toronto FC 3 - 1 Real Salt Lake: That first win of the season was due for Toronto FC and it happened on Friday night against Real Salt Lake. Jozy Altidore scored from the spot in the 23rd minute and got his second in the 45th minute, while Tosaint Ricketts got Toronto's third in stoppage time. Corey Baird scored RSL's only goal in the the 82nd minute but it wasn't enough to keep the visitors from losing out this time around. Chicago Fire 2 - 2 Portland Timbers FC: The Portland Timbers could not hang onto their lead as the Chicago Fire came back twice to earn a point. Diego Valeri scored the first of the game in the sixth minute and it took Chicago until the 50th minute for Nemanja Nikolić to level the game. Sebastián Blanco put Portland ahead five minutes later but Chicago pushed through again and found an equalizer in the 84th minute through Brandon Vincent. San Jose Earthquakes 1 - 2 New York City FC: New York City FC had to come back from being a goal down but they managed to do so in the second half. Yeferson Quintana got the San Jose Earthquakes' only goal of the game in the third minute of the game and they were unable to score any more than that. Anton Tinnerholm scored the equalizer for NYCFC in the 49th minute and Maxi Moralez scored the game-winner in the 60th minute. Houston Dynamo 0 - 2 New England Revolution: The New England Revolution piled onto the Houston Dynamo's misery with a solid 2-0 win over the home side. Teal Bunbury opened his account for the season with a goal in the 15th minute and Cristian Penilla secured the points with his 71st minute goal. Minnesota United FC 0 - 1 Atlanta United FC: Atlanta got themselves a road win against Minnesota this weekend thanks to a third minute Francisco Calvo own goal. Atlanta suffered multiple injuries to key players in this game and were down to ten men just before half time but they managed to stay ahead and win the game. Seattle Sounders FC 0 - 1 Montreal Impact: A 60th minute Jeisson Vargas goal consigned the Sounders to their third defeat in a row. 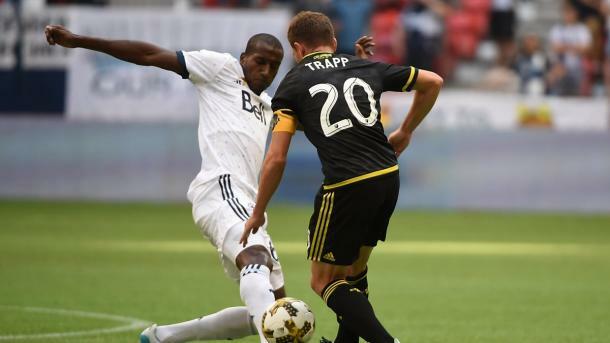 Kelvin Leerdam received his marching order in the 40th minute and although the Sounders tested goalkeeper Evan Bush on numerous occasions, they could not find their way to goal. Sporting Kansas City 1 - 0 D.C. United: Sporting Kansas City stay on top of their conference after their win over D.C. United. Felipe Gutiérrez got the only goal of the game in the third minute and neither team were able to add to the scoresheet after that.